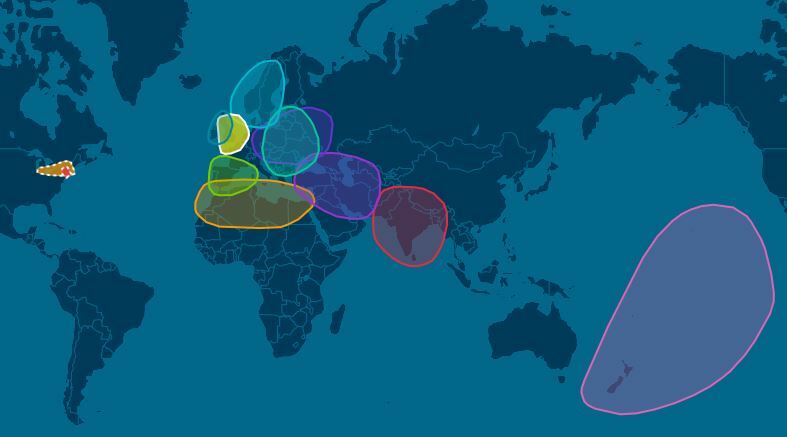 A couple of months ago I had my Mom order two DNA tests from Ancestry so I could see what my parents results would be. When I was back home for Thanksgiving I was able to take a good look at the results. Tonight I will share the Ethnicity results. They are generally as I expected, but with a little bit of interesting variations. 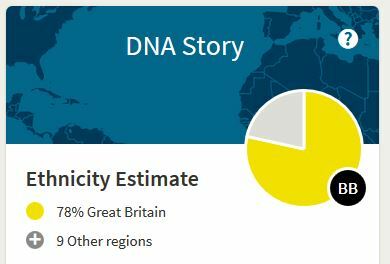 I was a bit surprised that my Dad was 78% Great Britain. I was expecting something more in the range of 60%. I was expecting to see Western European in the list of regions as my Dad’s mother had a Dutch surname and I know of a few other branches that have Dutch in them. I also know of several branches with German ancestry. The Iberian Peninsula at 5% is a bit surprising. I don’t know exactly where this comes from. I will have to do some more research. The Asia South and Polynesia are interesting. However, with only <1% for both it would be far back in my ancestry. The same goes for Africa North, which may tie in with the Iberian Peninsula. Then there is that tiny bit of European Jewish. It will be interesting to see if I can find where these little bits of DNA come from. Here is the Ethnicity map. You can see that the family is from all over. The yellow circle is Great Britain and when I looked close it also included the Norman areas of France and also Belgium and the Netherlands. Perhaps all of my Dutch ancestry is just showing up along with the Great Britain region. In the US you see two small colored areas. These are Migrations that I will most likely discuss in a future post. Now for my Mom. 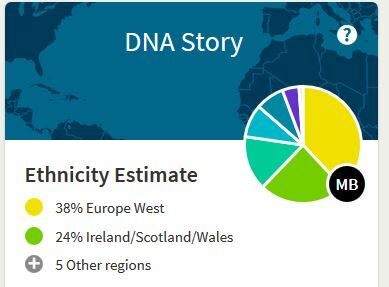 Her DNA is a bit more diverse with 38% Europe West and 24% Ireland/Scotland/Wales. These results actually make a bit more sense to me, but there is still a bit of mystery. My Amish ancestry would be the Europe West and Europe South which add up to 47%. There is a bit of Native American in that half of the family, but with it only being about 3% the DNA must not have come down in our branch or it shows up as something else. The Ireland/Scotland/Wales and Great Britain add up to 39% which covers most of my Grandma’s side of the family. The Scandinavia probably feeds into ancestors who came from Ireland and Scotland. 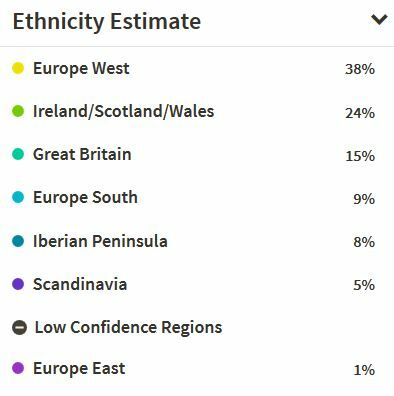 The only real mystery is where does the 8% Iberian Peninsula come from. To me, this number is a bit high. 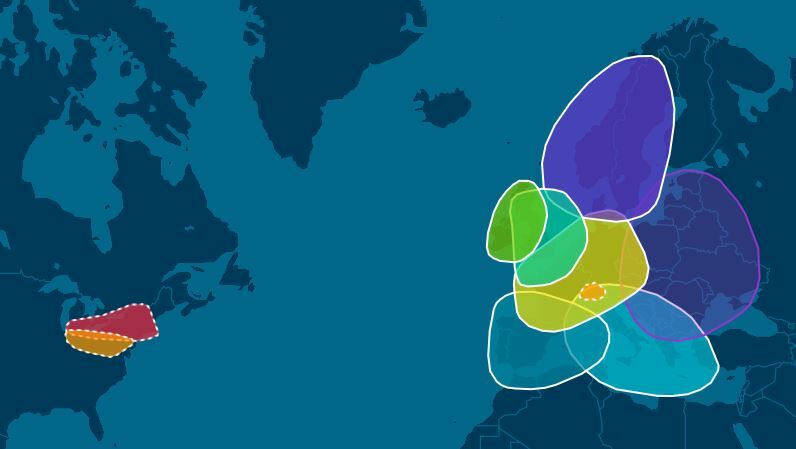 I know that part of it is straight back on the maternal line as my sister had a mitochondrial DNA test done years ago as part of a National Geographic program through work. In the map you also see two Migrations, including the Amish migration point in Europe. You can see that it is right at the intersection of Europe South and Europe West. It is also close to the Iberian Peninsula region, so perhaps some of that 8% comes through the Amish. 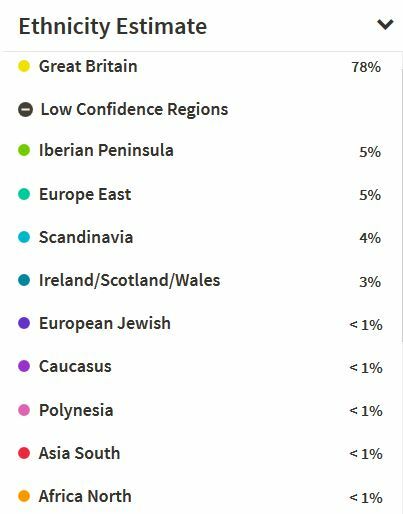 This entry was posted in Culture, Family History, Genealogy and tagged Ancestry, DNA, Great Britain, maps, Migration, Mitochondrial DNA. Bookmark the permalink. Here is a possible linkage for your Scandinavian heritage (I’m 16%): Sarah Jane Hellyer, her father Thomas Hellyer, his father George Hellyer, his father Stoneman Hellyer who married Alice van Horn b. 1730 – her father Barent B. Van Horn b. 1691, his father Barent C. Van Horn b 1651 in North Holland, Netherland – his father Christian B. Van Horn b. 1626 in the Netherlands – who married Jannetje Jans b 1629 in Utrecht, Netherlands. Whew. Do you have different links? Carel. I have these in my offline genealogy program, but not yet on Ancestry. I finally joined so I could see the DNA results and am slowly getting my tree put in.